Tanya and Doug Hiltz are still serving up free hot soup every night in their backyard to whoever needs it — even after the city forced them to tear down their dining space. 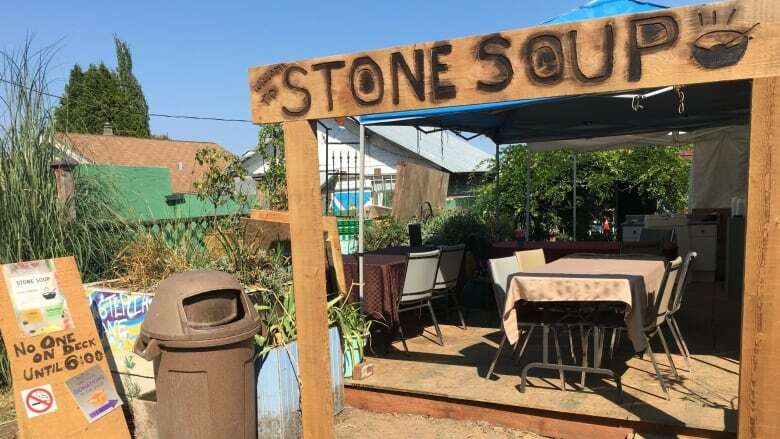 The Nanaimo, B.C., couple have been operating Stone Soup, a community soup kitchen, out of their backyard for just over a year. 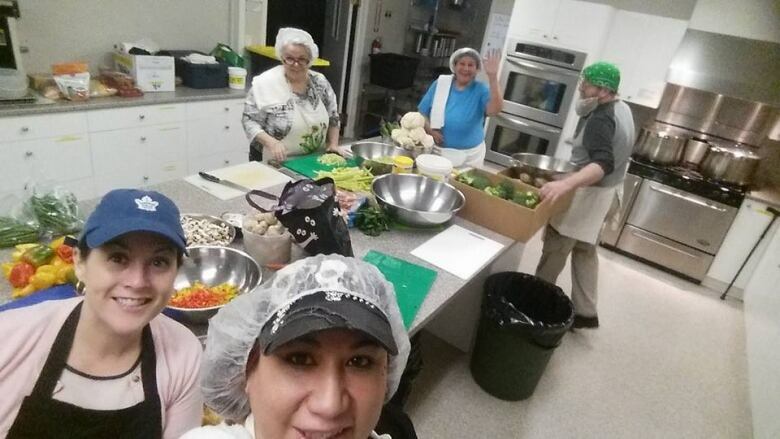 The soup is prepared offsite by volunteers, entirely out of donated ingredients. Hiltz says they cater to about 160 people every night. She estimates they've served up more than 50,000 bowls in total. "We have the homeless. We have the working poor. We have families. We have seniors. We have backpackers from around the world joining us," Tanya Hiltz told As It Happens host Carol Off. "We're open to anyone who needs a good hot meal." 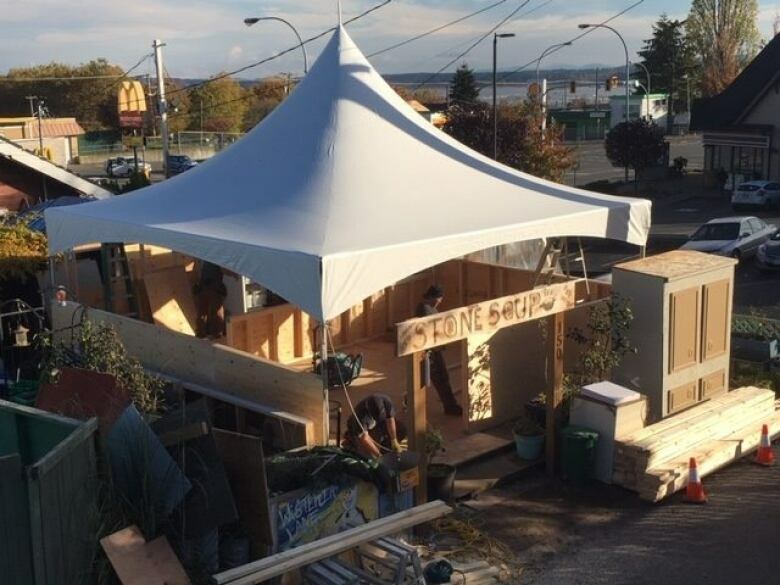 Initially, they ran Stone Soup out of a tent, but then a local construction company donated the materials and labour to build them a shed-like outdoor dining structure, with a floating deck, walls and a countertop, in the fall of 2018. "It gives them a little sense of security," Hiltz said. But in February, an anonymous complaint prompted the City of Nanaimo to send a letter to the couple's landlord saying the structure must be removed because it was constructed without a proper building permit. Volunteers began dismantling the Stone Soup shack on Monday. Dale Lindsay, Nanaimo's director of community development, told As It Happens the city has no choice but follow up on complaints and make sure local structures have the proper permits and meet safety standards. He said the homeowner can apply for a permit to rebuild the shack, or Stone Soup can find another location that's already up to code. "This is something that I think has grown sort of organically from good intentions, and I think there's no ill-intent by the operators," Lindsay said. "I think it just got to the point when it should have obtained a building permit." Hiltz scoffed at the notion Stone Soup isn't up to code. "Hello? This is [the] homeless. They are used to being outside, and McDonald's is across the street," she said. Getting the proper permit to rebuild will be a struggle, she said. She and her husband rent the house, and she says the anonymous complaint has fuelled tension with their landlord Paul Manhas. Manhas told NanaimoNewsNOW he supports the couple's mission, but that he has concerns about Stone Soup operating out of the backyard, and that he would not support efforts to apply for a permit to rebuild the structure. But whether they have a structure or not, Hiltz says there's no way they're shutting down Stone Soup while there's still a need. "We're back using the tent again. That's where we started the first time so we're used to it," she said. According to Nanaimo's own data, there were 355 homeless people in the city of 90,000 as of April 2018. The city shut down a tent city in October that had more than 300 residents. And Stone Soup is the only place in town to get a free hot dinner, Hiltz said. When it comes to emergency food services, there is food bank, a breakfast club that offers morning meals free of charge, and the Salvation Army Meal Centre, which charges $2 for a hot dinner. "We're not struggling to survive. Our donations are still rolling in. Nobody has turned their back on us," Hiltz said. In fact, she says Stone Soup's volunteers are already working on the next batch of free grub. "From what I hear from the lovely ladies in the kitchen, they're having a chicken soup and I believe it is going to be a hamburger soup — so probably a chili." Written by Sheena Goodyear with files from John McGill. Interview with Tanya Hiltz produced by Allie Jaynes. An earlier version of this story stated that Stone Soup estimates it has served 500,000 bowls of soup over the last year. In fact, it was 50,000.